Introduction to the process behind the illustrated standard. Drafts, proofs, overlays, and final drawings created by the breed standard artist working with the committee. How is an illustrated standard created? The answer is not as simple as one might think so it is important to consider the primary purpose and uses. Purpose - An illustrated standard or illustrated breed standard should educate and represent what is correct or faulty for the breed, always following the text of the breed standard. It should be a lasting tool by which dog breed clubs guide and educate their judges, members, and students of the breed. It is generally presented in booklet form although, with technology, some clubs are now hosting illustrated standards on websites for immediate access. 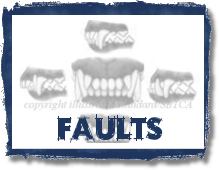 It is a pictorial guide with the purpose of demonstrating correct and faulty in a breed of dog. For those reasons, it needs to communicate the important things in a clear and straight forward way. Use - Illustrated standards are used by parent breed clubs in the American Kennel Club, United Kennel Club, Canadian Kennel Club, FCI, and clubs around the world to convey the particulars of their breed. Although dog breeds may be recognizable throughout the world, there are sometimes important differences imposed by location, such as cropping or docking of ears and tails. Although it is still the same dog, illustrated standards can actively demonstrate the desired attributes of these variations. This visualization of the breed can also be used as a judges' study guide, a tool which the American Kennel Club is encouraging breed clubs to utilize in education. 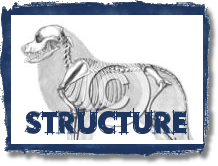 The illustrated standard can be presented as an additional abridged version which judges may carry with them on assignments for a quick summary of important points of breed type, structure, and movement. Presentation - In addition to conveying breed information, illustrated standards should also be visually pleasing. Depending upon the desires of the club, they can be a genuine work of art. It is the important task of the illustrated standard committee and the artist to work as a team and communicate the essence of breed type, as well as correct structure of the healthy and sound dog. 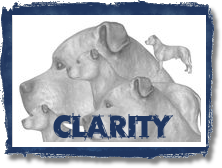 To truly educate, the focus of the presentation should be beautiful illustrations which are still presented in a straight forward manner, emphasizing views with which one would normally evaluate a dog. Process - The parent club of a breed commissions the artist to work with the selected committee to create a visual blueprint of the breed. The committee normally consists of mentors of the breed who have a history of breeding, exhibiting, or judging. The artist should be experienced in completing the specific project type in a professional and timely manner, and have a solid background in dogs. Since 1990, I have worked with a great number of clubs to create these very important projects. It is a challenging project which may not be suited for every artist. The following pages will demonstrate the process and available options in creating the illustrated standard, with artwork examples from the portfolio of work. This section includes 9 more pages, each regarding a certain aspect of the process. To access a page, select any page title from the drop down menu found under The Process link at the top of this page or select an image link below. To see the entire section in sequential order, navigate to the bottom of each page and follow the "Next" link. For sequential navigation, begin with the Drafts link below.